The 1955 Chicago Bears in their team photo at Wrigley Field. On December 17, 1950, the Chicago Bears were in Los Angeles facing the Rams in the NFC Championship game. 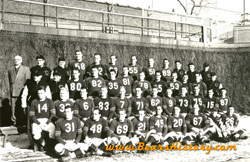 The Bears had won four titles in the 1940's, still maintained some of those players on their roster, and looked to make this new decade another dynasty era for the team. But it was not to be. Following a 9-3 regular season, the Bears lost 24-14 in the Championship game to the Rams. In the words of legendary defensive end Ed "The Claw" Sprinkle, "it seemed like we were in it every season during those years, but could just never get over the top." Sprinkle was just one of many feared Bears offenders and defenders in the 50's, which was the decade the Bears became known as the "Monsters of the Midway." This was no catchy name without substance for the 50's Bears: they truly lived up to the moniker, even if they didn't win a championship. Perhaps first on the list of feared Bear defenders of the decade was Sprinkle. Nicknamed "The Claw" for his propensity to tackle quarterbacks and ballcarriers with a sweeping arm, Sprinkle originally came to the Bears in 1944 from Hardin-Simmons College in Texas. A college teammate of center Bulldog Turner's, Sprinkle made the team as a small offensive lineman while George Halas was in the South Pacific. Upon Halas' return, he immediately was switeched to defensive end and became a legend. Sprinkle got the reputation for being a "dirty" player, a label he insists to this day was untrue. Interviewed for the book Chicago Bears History, Sprinkle said "if playing tough football makes one a dirty player, I guess I am, but I never did any of the things anyone would constitute as being "dirty". Other unforgettable defenders the Bears fielded during the decade included linebacker George Connor, defensive linemen Fred Williams and Doug Atkins, and linebacker Bill George. Turner, Connor, Atkins and George are all members of the Pro Football Hall of Fame. Chicago also fielded unforgettable offensive players during the 50's. The quarterback position was usually manned by the "Three B's": Zeke Bratkowski, Ed Brown, and George Blanda. In 1955, powerhouse running back Rick Casares was drafted, and would remain the second all-time leading rusher for the Bears until 1992. Mike Ditka called Casares the toughest man to ever play football for the team. Catching passes in the late 50's was receiver Harlon Hill, a product of tiny Florence State Teacher's College in Alabama. In 1956, Hill made perhaps the most spectacular reception in NFL history against the New York Giants, a play still shown in highlights to this day. In 1956, Halas made another supurb acquisition when he selected running back Willie Galimore from Florida A&M. Galimore became known as "Willie the Wisp"; the most jittery-running back in the game at the time. Bringing together all these rough personalities was, of course, Halas himself. To emphasize the type of persona Halas brought to the Bear sidelines in the era, Sprinkle likes to recount a story of a game in Green Bay sometime before 1955. The Packers had a tackle from Michigan playing for them, who wore what Sprinkle says was a "cute little moustache." According to Sprinkle, Halas offered to pay $5 to each player that brought him a hair plucked off that particular enemy's face. Halas attempted his first retirement in 1956, when he handed the reins of the team over to longtime player, friend and assistant Paddy Driscoll. The new coach took the Bears to the NFL Championship game that year, which his team lost to the New York Giants 47-7. The following season, Halas decided to give coaching one more run in the effort to secure one last title for his team. Halas embarked on this goal with a vengance, designing new offensive and defensive strategies that would once again be revolutionary to the game, as his new plays were both in the '30's and '40's. Following the 5-7 season in 1957, Halas' teams finished 8-4 the following two seasons, priming the championship run of the next decade. The 1950's were the first 10-year span in which the Chicago Bears did not win a championship. This was the decade Chicago became known for playing an especially brutal brand of football.